James spent more than a third of his life in exile. In 1648 he escaped the civil war in England, fleeing to The Hague and then Paris, and passing the next decade serving with distinction in the French and Spanish armies. 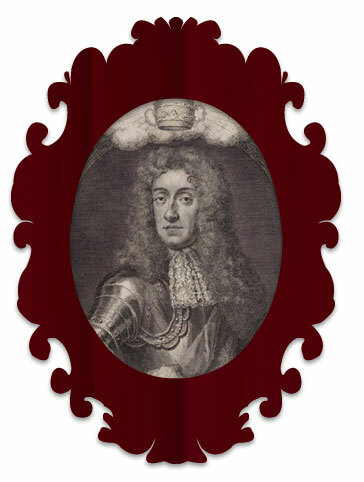 In 1660 the Stuarts were restored under James’s brother Charles II. Influenced by the lives of Catholics he met on the continent James gradually converted to Catholicism, causing a political crisis in the late 1670s. To diffuse the situation he was banished to Brussels before taking up a successful role in Edinburgh as the King’s High Commissioner from 1679 to 1682. After becoming king in 1685 James introduced religious toleration for Catholics and Protestant dissenters and, going against previously established laws, placed many Catholics in positions of authority. James’s Catholicism made his position as king untenable and he escaped to France in 1688 following the invasion of William of Orange. James attempted to regain his crown through war in Ireland but was defeated by William at the Battle of the Boyne in 1690. He spent the remainder of his life in pious exile at the palace of Saint-Germain-en-Laye near Paris.